Better late than never. 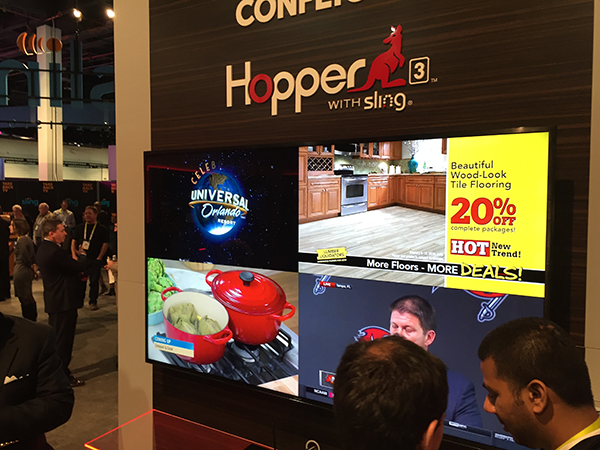 Yes, I understand that you all probably have seen pictures of the DISH booth at CES by now from other sites. I finally got to the booth late yesterday and it took a little while to get this all put together. Hopefully these pictures fill some of the gaps in your knowledge. 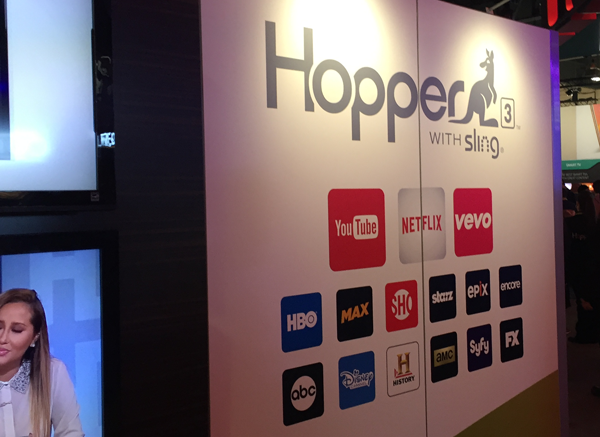 Of course this was the star of the show and there were several Hopper 3s in residence. 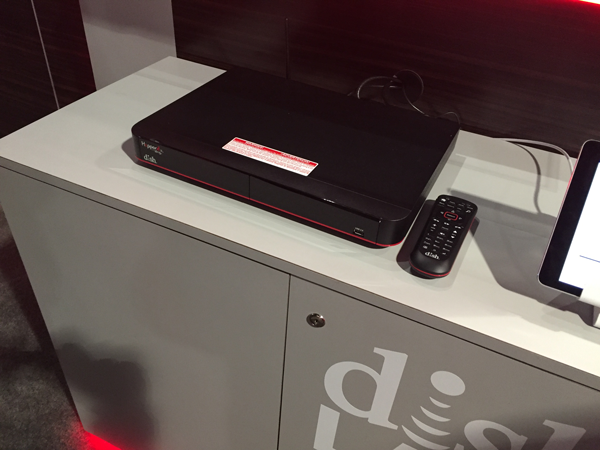 This is DISH’s new 16-tuner DVR, the undisputed king of the DVR wars in ’16, if you count by tuners. It’s hard to say for sure but it looks like it’s slightly bigger than the previous Hopper but not by much. In addition to the standard remote that will ship with Hopper 3, which has been totally redesigned, there is also a Smart Remote which is similar to what we saw last year (which never shipped.) This new remote should be available this year. It features a touchpad interface which is something DISH has been promising since 2008 when they showed the prototype 922. 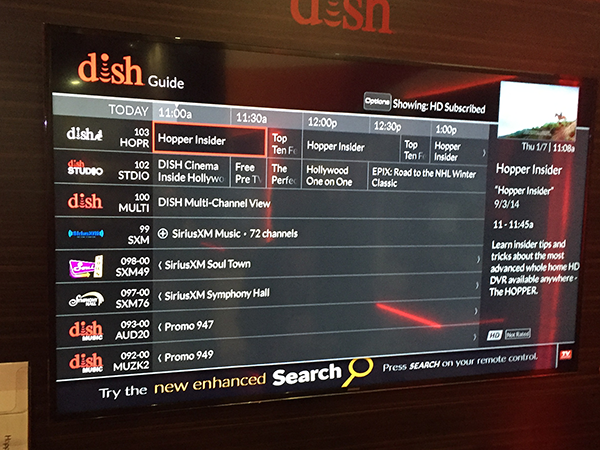 The Hopper 3’s user interface looks very similar to the new HD Menus that DISH showed last year. These still looked to be mockups and not working menus, so it’s not possible to judge performance. Sports Bar mode works pretty much as you expect it would. 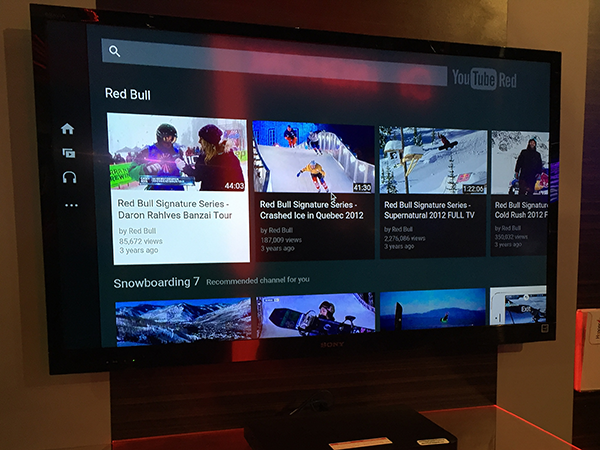 There are four large, clear HD pictures on a 4K TV. I saw a little less enthusiasm on the show floor for this product, but I do think it’s a solid little box – and it is certainly little. It’s maybe 3x3x.75″ in size. 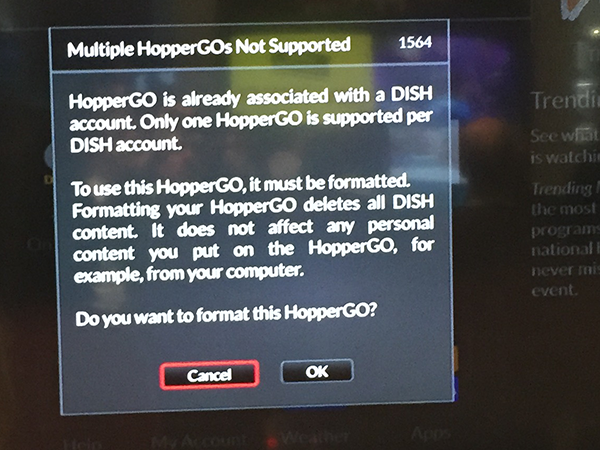 DISH reps confirm that at least with some programming, you will be able to keep programs on the DVR while they are also on HopperGO, and in some cases content won’t disappear after 30 days. But this seems to be on a purely program by program basis and it’s not clear how you would know this ahead of time. I’m not sure exactly why there was an error message up on one of the TVs but it did confirm another question that’s been floating out there — you get one HopperGO per account, just one. I’d put this one in the “maybe someday” category. DISH was showing off a new system on a pedestal labeled “DISH LABS” which to me means this is a prototype. 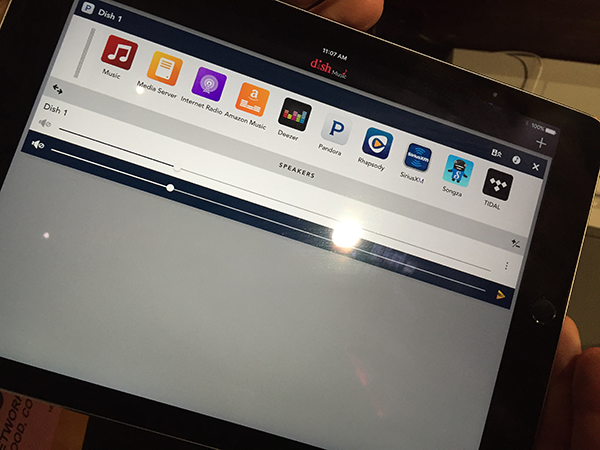 The idea here is that you would use your Hopper as a music server and that it would stream not only to tablets but to approved hardware. No word on when or if this will ever hit the streets. 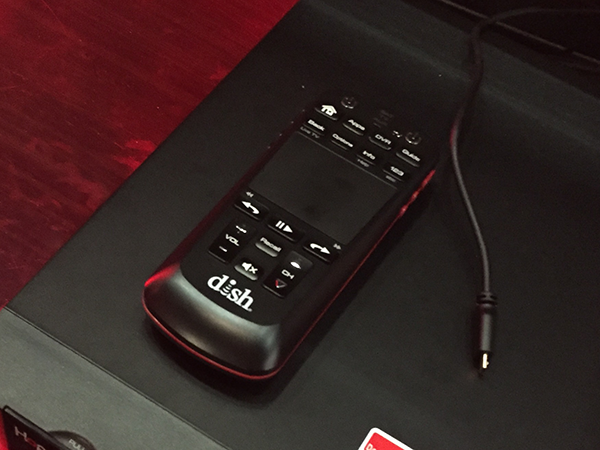 DISH is always fun to see at CES and this year I think they are a lot closer to delivering some of the stuff at their booth than they were last year. 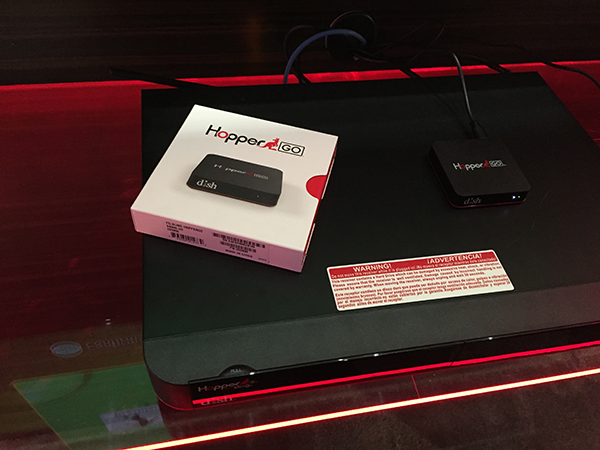 I do know the 4K Joey is really right around the corner and they seemed really focused on delivering the Hopper 3 as soon as possible. Keep watching these pages and I’ll let you know when it’s available!